Evening all! This week I’ve decided to base the Sitting Pretty Styles feature around the Barbour jacket I got for my birthday back in September. Since I got it a few people have said they would be interested in seeing how I’d style it. I haven’t really had the chance to feature it in an outfit post yet, so I thought this would be the next best thing. Rather than doing a casual and a formal look (I wouldn’t personally wear a Barbour jacket on a night out or to a meal, but each to their own!) I’ve done an every day look, then more of a relaxed outfit to put it more to its use. This outfit is more of a traditional way to wear the Barbour jacket, think countryside walks, camping and rainy days but done in style! Not a lilac cagoule or hiking boots in sight! 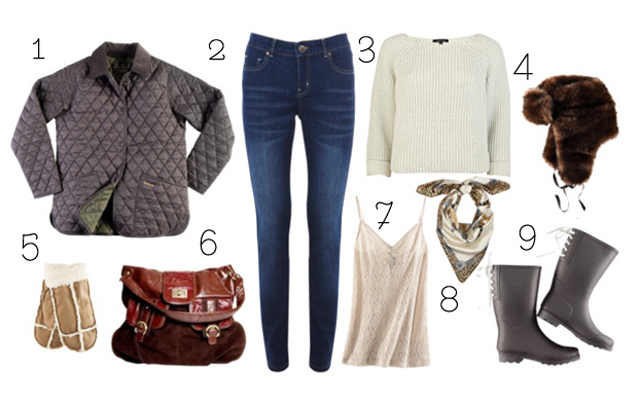 I’d wear some skinny fit jeans tucked into leggings, teamed with a chunky jumper over a longline camisole or vest. I’d then accessorise with a faux fur hat, sheepskin mittens and a vintage style scarf. I’d also carry a chunky brown bag! For the second look I’ve come up with a more relevant way of wearing the Barbour. It now seems to be bought more for the fashion element that the practicality, so this version shows how to wear it in a more style focused outfit. This is how I tend to wear mine too! I usually go for a pretty vintage inspired dress over some thick tights teamed with boots. I’d also snuggle up with some chinky knitted accessories such as a hat and long scarf, and carry a satchel style bag in a complementing colour. To finish off I’d add a splash more colour with a bright lipstick. Well? What do you think?! Let me know how you’re all wearing your quilted jackets this winter. I’d love to hear how you style them! absolutely adoreeee look two! great picks lady. Adore both these looks… the dress in the second look is beyond gorgeous! and need both the hats lol! I just want everything here! I do love that chunky knit mustard scarf.